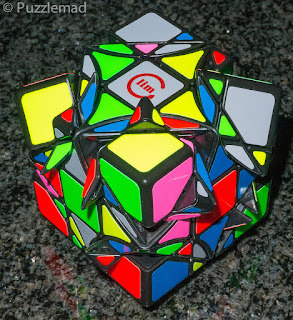 The Dreidel 3x3 - looks harmless enough! 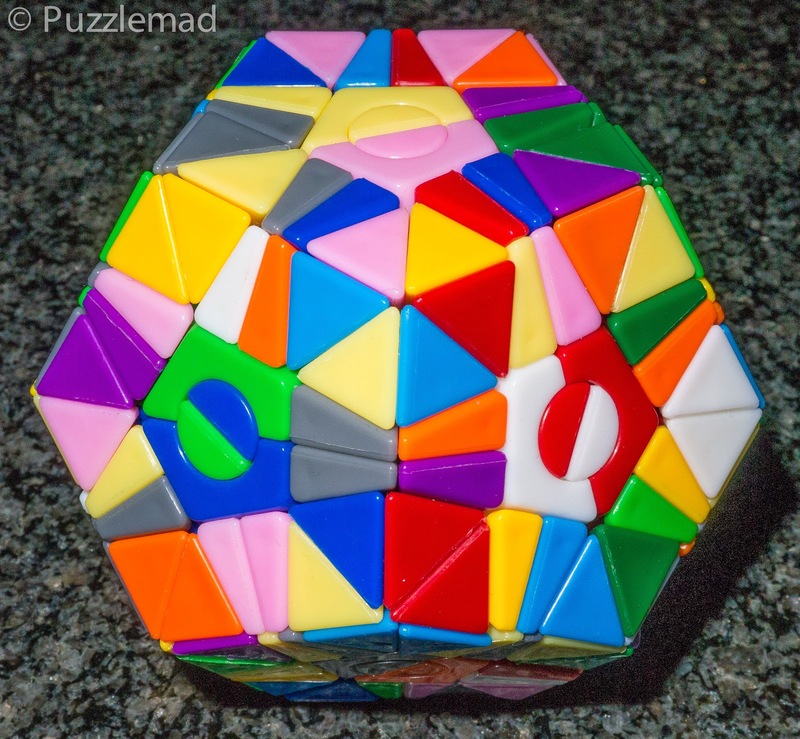 I was all set to write a post on one of my last few Puzzle Master puzzles when I had a sudden breakthrough towards the end of the week and just had to write about something truly brilliant. 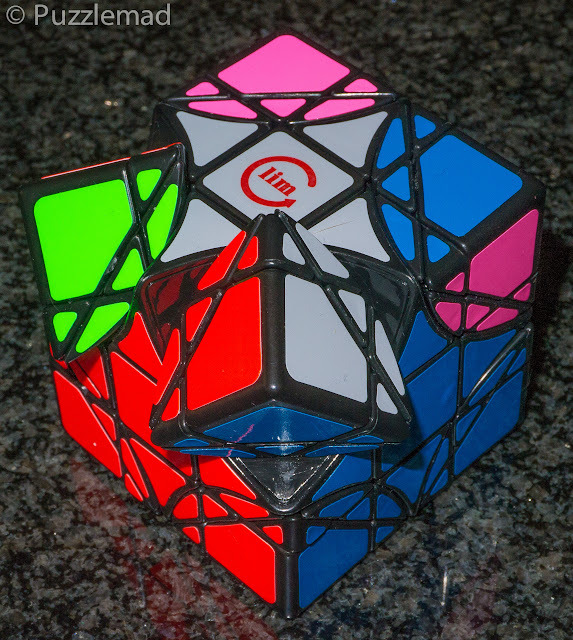 Pictured above is a rather innocent looking twisty puzzle called the Dreidel 3x3 produced by limCubes. I have been working on this amazing puzzle for the last three weeks and finally managed to solve it in a repeatable manner. Sticky-out bits - puzzle from Hell? and what is more, despite the tremendous complexity of the mechanism, it turns like a dream and barely catches (unless you have made incomplete turns). So we have a 3x3 with which you can truly frighten your friends and with a pretty reasonable price tag too at a mere $39. Now you might be thinking - am I mad? Why on earth would I want to buy something so hideously complex as that? Believe me - if you are in any way into twisty puzzles, or a general collector of puzzles then you need this in your collection. 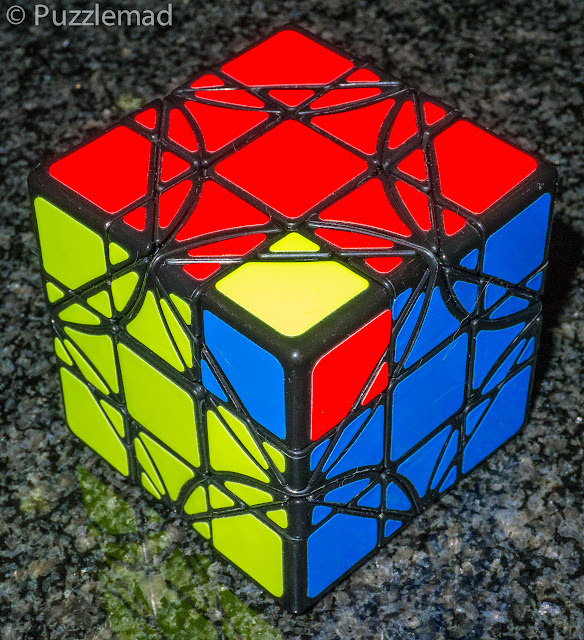 It looks fantastic and moves beautifully and is actually within the solving grasp of any reasonable twisty puzzler who has gone a bit beyond the standard 3x3. It is a challenge, but that is a good thing - it is NOT beyond your grasp. Even I was able to solve it without referring to the internet for assistance. The ecstasy of the final Aha moment was wonderful! 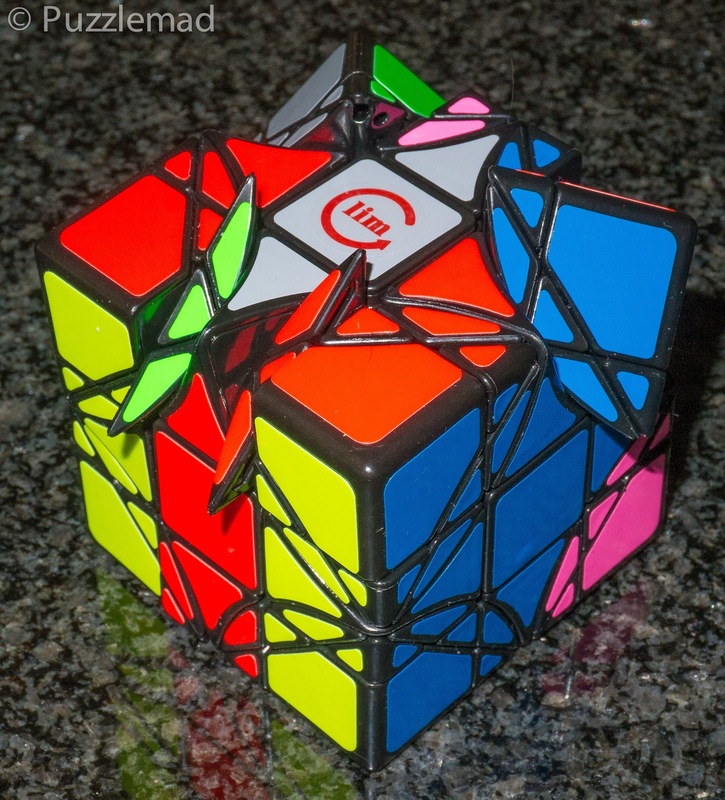 Normally, when I get a new twisty, I spend time with the puzzle looking at what standard algorithms do before I actually scramble it. Not with this one! So what did I do? First of all I was a chicken and scrambled it using only 120º corner turns first of all. This produced no sticky-out bits and of course left the corners intact. The only extra effect it had beyond a standard 3x3 was to split the edge triples off and move them around - it didn't even split those triples up. 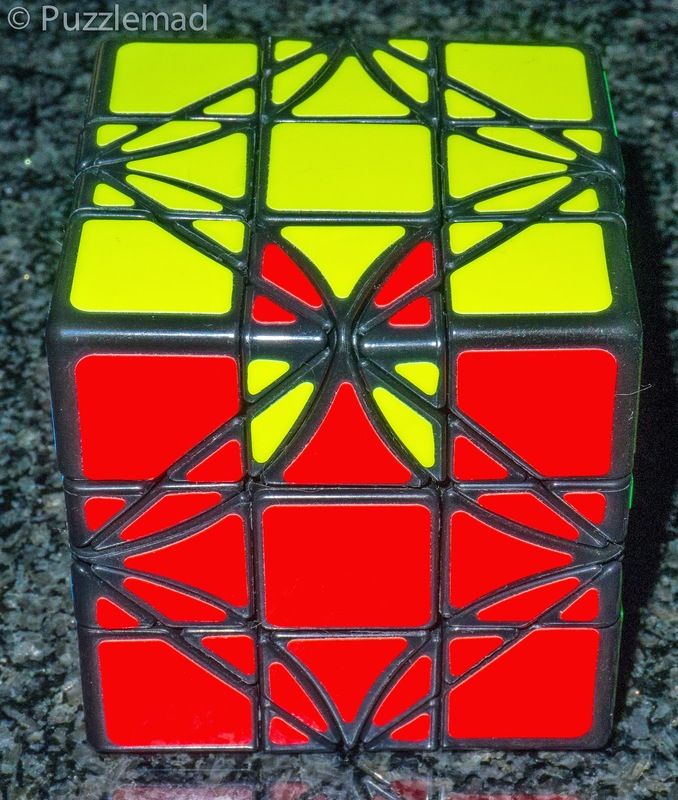 Still looked scary but I managed to solve it within 10 minutes........Almost!!! Uh oh! That's not "normal"
I seemed to have just a single corner rotated - this is an absolute impossibility in a standard Rubik cube! I stared at this with horror for a few minutes and even posted a picture on my Facebook page. I called this a parity because it is caused by an incorrect reduction back to a 3x3 cube and thankfully it only takes an intuitive 7 moves to correct it. Lulled into a false sense of security, I immediately did a full scramble with no other investigation first and just using intuitive methods of pairing up the corners with their little triangle pieces and then bit by bit recreating the edge triple pieces and moving them out of harm's way (this took me a little while to figure out, but all done entirely by intuitive means) and then, finally repeating my solve as the previous time. 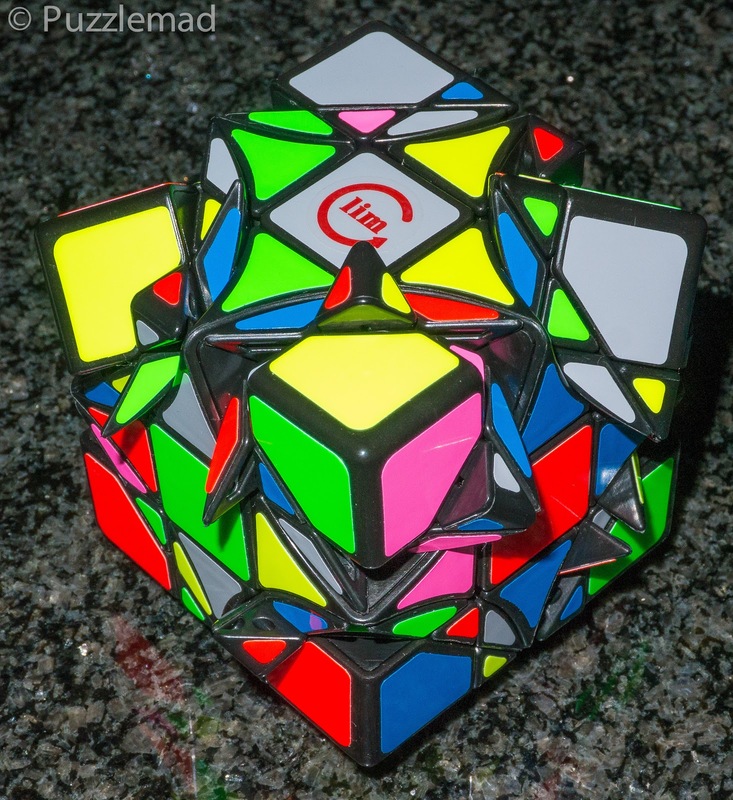 I was flushed with success when it all just worked and I had a fully solved cube! "I'm a genius!" I thought to myself. Dear Lord! What have I done? Hmmm! Just 2 edge triples wrong in the whole thing - another type of parity and I had absolutely no idea how to resolve it! It is usually impossible to be required to swap 2 pieces in twisty puzzles, it usually requires a 3-cycle - I was stumped. I sat and fiddled with this for a day before finally working out a technique to fix it using middle slice turns - in reality it was a 6-cycle. I am embarrassed to say that the resolution technique was fairly simple but took me a very long time to see the light - I am sure that the rest of you can work it out much quicker than I did! 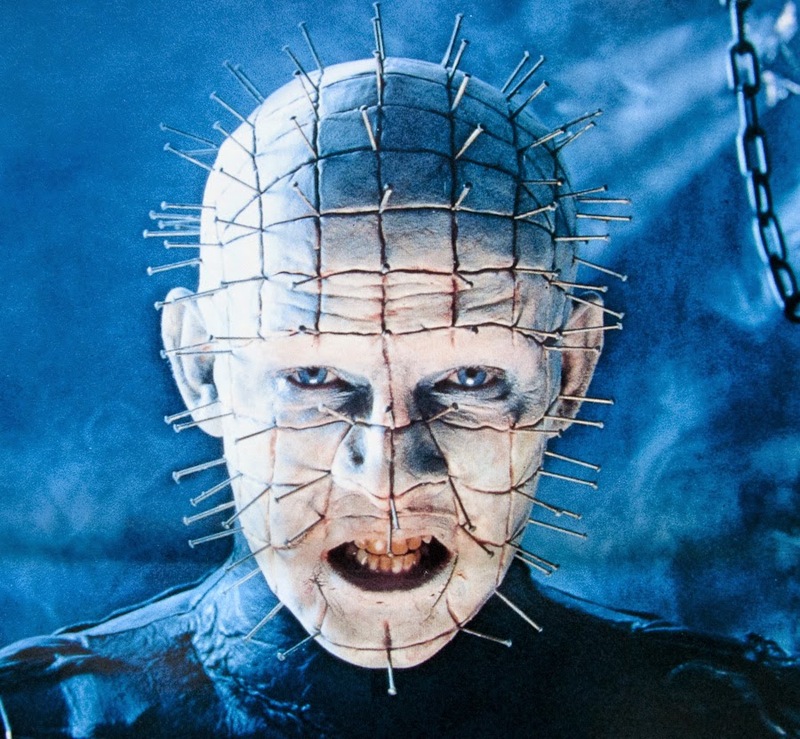 I put it down after that for a rest and a day later at work I decided to horrify my colleagues with the "Hellraiser" cube and have another go. Well one aspect of that certainly worked! I horrified a lot of people showing them how it worked - my orthopaedic colleagues all wanted to hit it with a hammer but they are brutes and solve everything that way!! I gradually worked on pairing it up again intuitively and....... I couldn't make it work! I just could not get the last few pieces to pair up. each time I did one of them, another one would be broken apart! Sob! I worked on it for days and then a week and then two! Luckily I have already lost most of my hair as I might have torn it out! Finally I put it down for a while and had to think (thanks Allard for the advice!) I recalled that a few weeks earlier Martin (he's got a fantastic YouTube channel) had mentioned on Facebook that he had done the cube solve first and avoided the parities that way. So I decided to try that approach and quickly did the central parts of the edges, the corners and then again, by intuition managed to move the 2 colour pieces of the edges into place. I was now left with all the wide triangles sticking out all over the place and no obvious way to move them around! Hmmmm! I really didn't want to ask for help. I knew I needed to find some way to make a 3-cycle - this is what I usually do with the unscrambled puzzle first - I hunt for a commutator. But I generally can't do that with a fully scrambled puzzle. Derek suggested that I dismantle it and try to find a commutator once I'd reassembled it - I'd seen the result of a partial puzzle explosion and really didn't want to dismantle such a complex puzzle, so I decided to just persevere. The cube stayed with all it's bits sticking out for a few days when I suddenly had another Aha moment. I tried a fairly simple sequence of moves to recreate the edge triples one piece at a time and move them out of the way as I undid the moves. It seemed to be working but I had no idea which other pieces were moving at the same time until I had the bottom half done. I was then able to do my sequence on the solved bottom half and see how my sequence moved 3 pieces in a cycle. I was then able to alter it a little to allow me to move different pieces and BANG! I had all I needed to succeed - this, again, was entirely without any fancy commutators - it is pretty much an intuitive sequence. Within half an hour it was done with no parities! Since then I have repeated it multiple times and absolutely LOVE this puzzle! * I am a bit ashamed that a "bit of thought" took me such a long time but you all know by now if you have been reading my blog for any time that I'm really not very bright! 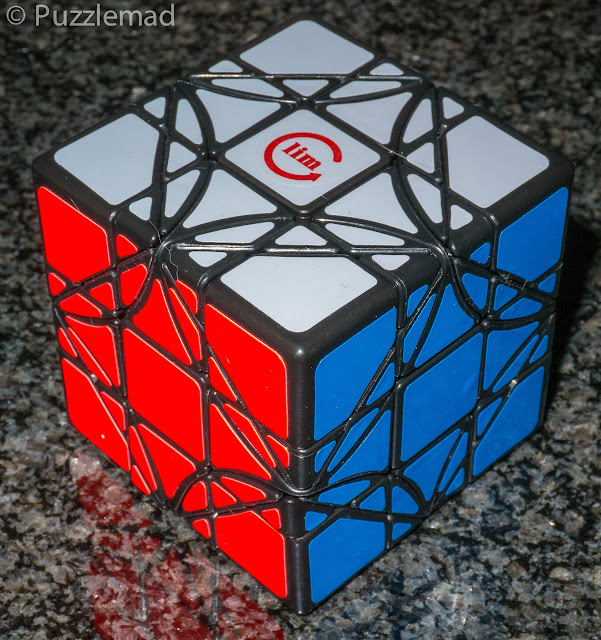 So all of you, go out and buy this cube to enjoy and to horrify your friends! It is the twisty puzzle of the year so far. I cannot wait to see what else limCubes has in store for us in the future - we live in a golden age of puzzling and twisty puzzling in particular!